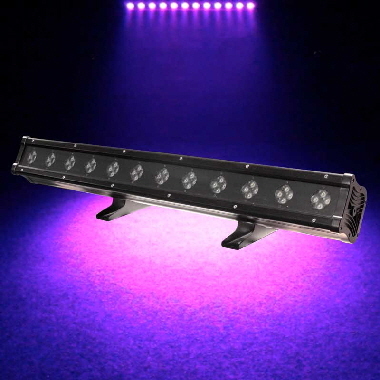 The LEDJ Xterior Wash Series is a long-life programmable luminaire offering full RGB colour mixing. Weatherproofed for the dynamic illumination of facades, structures, water features and monuments, it features a comprehensive colour range from 36 Ultra Bright LEDs. Housed in a beautifully designed weatherproof casing, the Xterior Wash is perfect for applications where projection distance is limited and is the ideal short-throw complement to the existing LEDJ Exterior range. Stylishly rugged, the Xterior Wash can be tucked discreetly into architectural design details of buildings or any other illumination structure and requires minimal service and maintenance. 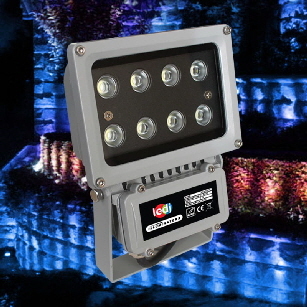 An IP65 rating means the fixture can withstand even the toughest outdoor conditions. The fixture is controlled by DMX or can function as a stand-alone unit or be synchronized master/slave to give maximum flexibility. This gives the option of simple and effective control, economizing on channels, or full comprehensive control when a designer needs it. 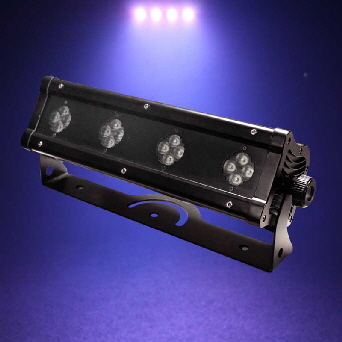 The Xterior Wash Tri is a RGB Tri LED architectural fixture featuring 21 x 3W high intensity tri LEDs. Suitable for all weather conditions (IP-65), the Xterior Wash Tri is ideal for lighting buildings and structures. The immense colour palette can transform environments using the fixture's incredible long throw capability. The Archi Bar 48 from LEDJ is a state of the art LED outdoor lighting fixture. It produces stunning colour washes from its 48 x 3W Ultra Bright RGBW LEDs that are held inside its robust metal IP rated housing (IP65). As well as doing colour washes it also has other great professional built-in programmes that can either fade through, do some fantastic colour chases and has the ability to be controlled via DMX to allow control of its endless colour mixing capabilities. The built-in auto run mode allows the operation of the fixture to be run with the need of any controller. To wash larger walls and stages multiple fixtures can be linked together Master/Slave via 3-pin XLR cables and the IEC power sockets. A user-friendly 4-button LED display on the rear panel makes for easy access to its various modes, programmes and features. 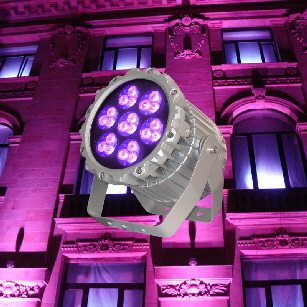 This very impressive fixture is specially suited to architectural and entertainment areas of the market and can give an unlimited colour palette that can enhance building facades, water features and focal points providing excellent colour displays. The Archi Bar 16TC from LEDJ is a state of the art LED outdoor lighting fixture. It produces stunning colour washes from its 16 x 3W Ultra Bright Tri-colour LEDs that are held inside its robust metal IP rated housing (IP65). As well as doing colour washes it also has other great professional built-in programmes that can either fade through, do some fantastic colour chases and has the ability to be controlled via DMX to allow control of its endless colour mixing capabilities. The built-in auto run mode allows the operation of the fixture to be run with the need of any controller. To wash larger walls and stages multiple fixtures can be linked together Master/Slave via 3-pin XLR cables and the IEC power sockets. 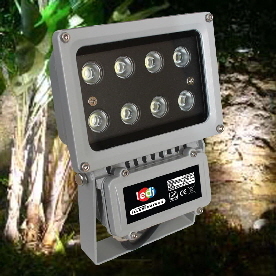 The Illuminator 2 from LEDJ is an ideal mains voltage floodlight in a aluminium alloy gasket sealed housing (IP-44 rated). The fixture is suitable for interior and exterior applications including: marquee lighting, architectural colour washing and the illumination of mature tree canopies and large expanses within the garden. Featuring 8 x 1 Watt Ultra Bright Blue LEDs, the fixture emits no heat and consumes only 8 Watts of power, yet delivers a light output similar to a 100 Watt traditional lamp.